Emily Kngwarreye emerged in the 1990s as one of Australia's most important contemporary painters. 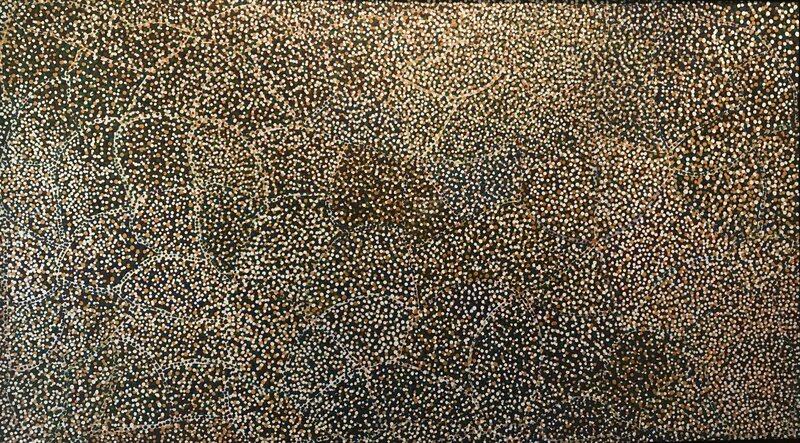 She painted her country, Alhalkere, north of Alice Springs in the traditional Anmatyerre way for decades before batik and then acrylic and canvas materials were introduced to the artists at Utopia, Alice Springs in the late 1980s. Kngwarreye was awarded the inaugural CAAMA Fellowship in 1989 and in 1998 her work was exhibited at the Venice Biennale. In the same year the Queensland Art Gallery, Brisbane presented a major survey exhibition 'Emily Kame Kngwarreye: Alhalkere: Paintings from Utopia', which travelled to the Art Gallery of New South Wales, Sydney the National Gallery of Victoria, Melbourne and the National Gallery of Australia, Canberra. In 1992 she was awarded the Australian Artists Creative Fellowship. A major retrospective of her work was mounted in 2008, by the National Museum of Art in Osaka and the National Art Centre in Tokyo, 'Utopia: The Genius of Emily Kame Kngwarreye'. Kngwarreye's work is well represented in all major public, corporate and private collections in Australia. 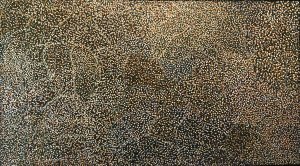 In the certificate signed by Janet Holt, January 1991, she writes: 'In this quietly resolved work, Emily Kngwarreye defines the post-summer dryness that created a muted, scattered carpet of seeds and grasses over the country. Her life long observations of her place called Alalgura on Utopia Station have taught her that despite the dryness, those underground tuber vegetables are just right for picking. When the wind sweeps away the grasses and leaves bare country, survival becomes tough.